For users who are installing Microsoft Office 2007 productivity suite with Office 2007 Blue Edition or other illegal and pirated Office downloads, which make use of volume licensing product key (VLK) to activate (or bypass activation requirement of) Office 2007, beware of KB949810 Office Genuine Advantage Notifications update, which will inactivate Office applications and display the nagging “not genuine” notification messages. Office Genuine Advantage (OGA) is not a new stuff. 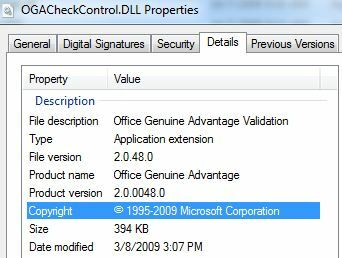 OGA validation, the component that determines if the software is legitimate) had been mandatory for Office users who want to access Office Update or download add-ons such as free Office 2007 templates for a while, making available OGA crack, although the requirement had since been stopped, allowing everybody, legit or counterfeit, to download updates and freebies. Office Genuine Advantage Notifications is another component of OGA that displays and shows persistent and nagging notification messages on the screens of PC which is checked to be running illegal copies of Office. Anyway, OGA Notifications will always come together with the validation component to determine the genuineness of the Office installed. It marks the first time Microsoft attempts to validate Office installation actively, similar to Windows Genuine Advantage (WGA) for Windows operating system. OGA Notifications had firstly been published as KB949810 update to Office users in the 4 countries of Italy, Spain, Turkey and Chile in a small pilot program, which did not bring too much complaints due to small user base, except when WSUS (Windows Server Update Services) accidentally published it as critical updates for roughly 24 hours. Microsoft has slowly expanding OGA availability to more countries. The Office genuine validation and notifications will be further expanded to 13 more countries which include United States of America (US), United Kingdom (UK), Peru, Puerto Rico, Brazil, Australia, Greece, Ireland, the Netherlands, Finland, Switzerland, India, and Taiwan on August 26, 2009, making it a total of 41 countries that subject to OGA validation, according to Microsoft announcement. 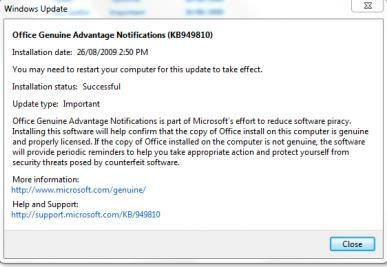 KB949810 Office Genuine Advantage Notifications will be published through Windows Update and Microsoft Update, as “High Priority” update for Windows XP systems and “Important” update for Windows Vista and Windows 7 systems. Good news is that download of OGA Notifications is voluntary. User can opt and choose to NOT install it. Bad news is that once installed, OGA Notifications cannot be installed, and there is no option to temporarily or permanently stop notification messages from displaying. Tip: Office Genuine Advantage Notifications (KB949810) can be manually removed, disabled or uninstalled. The push of KB949810 will take several months to complete the deployment (or non-deployment probe if user rejects it). Together with the new push, Office Sustained Engineering also announced that Office Genuine Advantage update is available. In the update, OGA validation component, OGACheckControl.dll, and other notifications component has also been updated to version 2.0.48.0 from version 1.7.111.0. How to reject Office Genuine Advantage Notification KB949810 update? KB949810 requires end-users to accept an EULA (End User License Agreement) before installation begins, even if the systems have Automatic Updates set to download and install all updates automatically. To prevent and stop OGA Validation and Notifications components to be installed, just deny the EULA. This copy of Microsoft Office is not genuine. Please excuse this interruption. This copy of Microsoft Office did not pass validation. Click Learn More for details and for help identifying the best way to get genuine Microsoft Office. And, a toolbar will be added to non-genuine Office XP and Officve 2003 programs or a ribbon element is added to non-genuine Office 2007 programs to display “This copy of Office is not genuine. Click here to learn more” message. Office Genuine Advantage Notifications (KB949810) will be published all systems with Microsoft Office XP, Office 2003, Office 2007 or upcoming Office 2010 suites or applications program. Users who have unknowingly purchased a counterfeit version of Office can receive a complimentary copy of Office, according to Genuine Office Support.